The system pairs the supplement with the Be Slimming Bar, an all-natural high-fiber bar, to give you greater control over your food choices and keep you fueled throughout the day. The Max Meta-Switch™ system is about smart weight loss - enhancing your body's inbuilt fat-burning mechanisms. Max International's Visible Solutions™ Skin Care System is designed to protect your skin and effectively treat problem areas to help you maintain your best looks, regardless of your age. After application you can see a difference in your skin's look as little as one minute. Continued use of Visible Solutions brings improvements in texture, hydration, clarity, and more. Max GXL provides the proper nutrients needed to promote the body's own ability to manufacture and absorb glutathione. 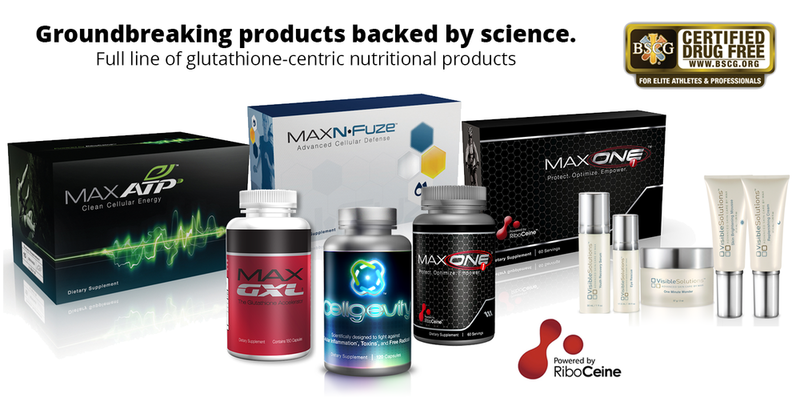 MaxOne utilizes the groundbreaking RiboCeine technology to provide your cells with the necessary components to product glutathione "on demand"